I always enjoy Earle Bergey's science fiction pulp covers. This one from the June 1950 issue of THRILLING WONDER STORIES is a good one. My old mentor Sam Merwin Jr. was the editor then, and he filled this issue with stories by Arthur C. Clarke, Raymond Z. Gallun, Mack Reynolds, Cleve Cartmill, Raymond F. Jones, and Margaret St. Clair. That's a fine bunch of authors and shows why TWS under Merwin's editorship has a good reputation, at least among old geezers such as myself. Sam Merwin really had quite an influence on STARTLING STORIES and THRILLING WONDER. He took over in 1945 and soon banished the childish Sgt Saturn and his cronies to outer space. By the time Sam Mines took over in 1951, both magazines had improved greatly and some even argue that they were more interesting than ASTOUNDING. Unfortunately the pulp era was ending and both titles were dead by 1955. Bergey is a big favorite with me also. It's fun reading the letter columns and laughing about how most SF fans were ashamed of his work. Well, his pulp art is now highly collectable and prices are no longer within reach of most art collectors. He died early at age 51 in 1952 while taking a stress test in his doctor's office. A great loss. 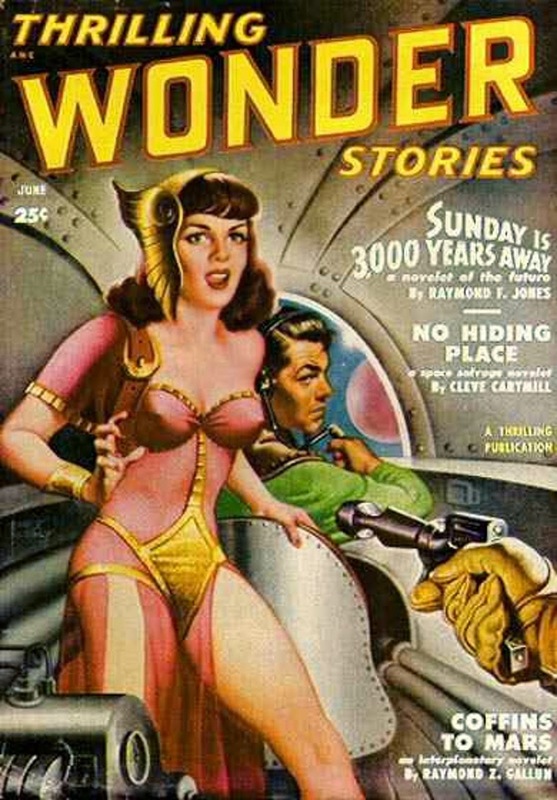 For years now Thrilling Wonder Stories has been one of my favorite SF pulps. I agree with Walker in comparing this title with Astound in the same time period. John Campbell had become rather dull and uninspired when I compare it to TWS and Startling.